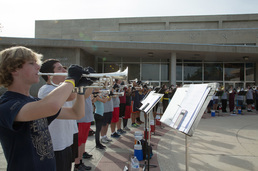 ﻿​﻿Auditions for the 2016 Golden Empire Drum & Bugle Corps will be held December 11th, 12th, & 13th at Bakersfield College. Please carefully read through the info below for details about the audition camp. The only expense for the audition/workshop camp is the $40 audition fee​, which you can pay in advance when you register online. Cash and checks or money orders made payable to Golden Empire Performing Arts will be accepted at the camp in addition to credit/debit cards. If you are offered a spot in the corps, your first member contribution payment will be due at the next camp.